2nd Floor, Swasthya Sadan, Mukund Nagar, Pune 411 037. Applications are invited from Specialists who have retired from Government Service (Preferably those who have retired from CGHS/CHS) for filling up the following vacant posts in CGHS Polyclinic/Wellness Centres in Pune on a purely temporary and on contract basis, as per the terms enclosed. Duly filled in applications should reach the office of the Additional Director, Central Govt. Health Scheme, Swasthya Sadan, 2nd floor, Mukundnagar, Pune 411037 on or before 08-04-2011. 2. Educational Qualifications: MD in Dermatology / MD in Pathology or equivalent qualification Recognized by the MCI. 3. Age: Not exceeding 62 years as onthe date of issue of this Advertisement. 4. Remuna ration: Lumpsum amount of Rs.55,000/- per month. 5. Duration of Appointment: Initially for a period of 6 months which may be extended periodically on a six monthly basis. 6. 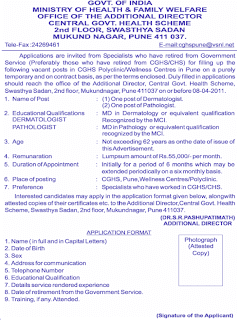 Place of posting: CGHS, Pune,Wellness Centres/Polyclinic.